War against climate change or a broad concept of security? Many of the arguments which could justify “green growth” might have been employed equally well in favor of one of the oldest and most sizable government policies: military expenditure. Theoretically, military expenditure has been linked to many productivity-improving civil innovations, such as civil aviation or the internet. Large scale military spending has been used to stabilize business cycles, replace cheap energy imports with expensive domestic energy sources (coal liquefaction), and to create a competitive edge in exporting military equipment. Even improved healthcare has been linked with military expenditure (Benoit 1978). 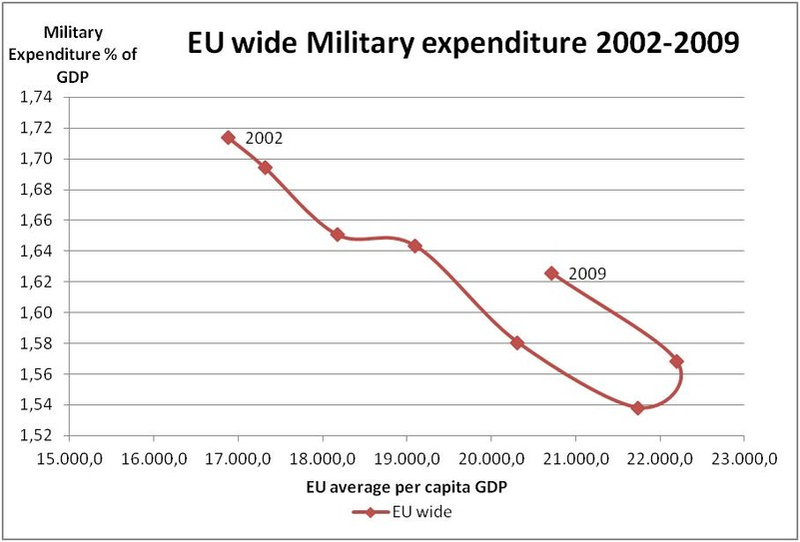 Similarly to green growth policies, the aim of military expenditure has been to create an insurance against “disaster”. 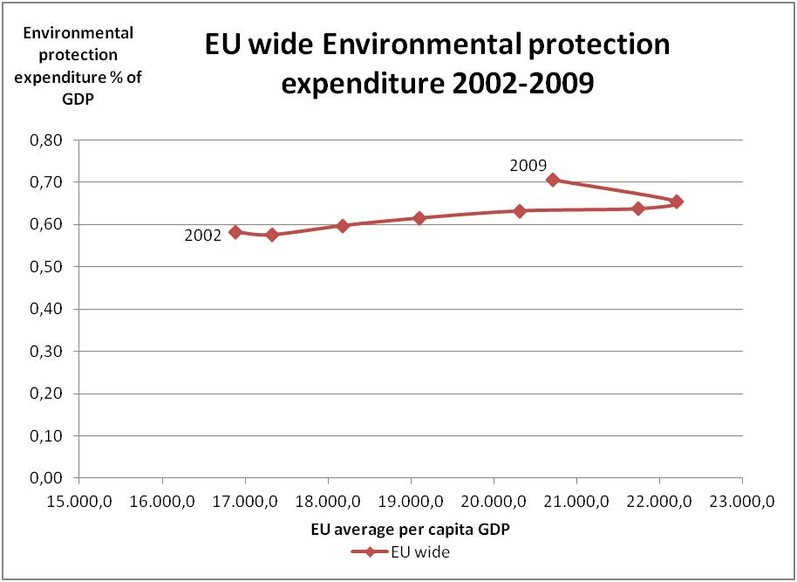 Looking only at green growth, Fay, Hallegatte, Heal, Tréguer argue against the common view that green policies involve large costs in the short-run, with much delayed gains in the long-run. They call for green growth actions now as benefits can be expected even in the short and medium term. They identify four channels of transmission from green measures to GDP growth: input effects on the quantity and quality of natural and physical capital, efficiency effects obtained by increasing productivity and correcting market failures, stimulus effects as a consequence of Keynesian green measures, and innovation effects, increasing the potential output of the economy. Dager and Sen identify three channels of transmission from military expenditures to GDP growth, which are comparable to the transmission channels of the green measures identified above: demand-side effects; skill formation, R&D, and technological progress; “modernization effects” on culture, bureaucracy, and public administration. Moreover, these authors claim that the optimal level of military expenditures is determined exogenously. It derives from strategic considerations and not from its effects on growth. It can have a positive externality effect, which brings into focus once more its similarities with military expenditure. 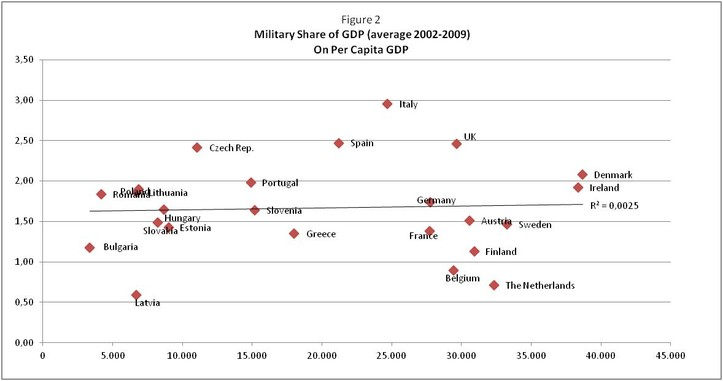 Looking again at the macro level, Michael S. Leonard suggests that military expenditure is suitable only above a certain per capita GDP and in the absence of free riding benefits. Surprisingly, the literature does not provide a comprehensive empirical answer to the question of whether, and under which conditions, military expenditures are growth friendly. Several authors have found correlations between military spending and growth. Landau (1996) finds that, below a certain threshold, increasing military expenditures is growth enhancing. However, other authors either claim that these correlations do not constitute causality or do not find a correlation at all (Benoit 1978 for developed countries). Some even detect negative correlation, such as Faini et al. (1984), who find a 0.13% lower GDP growth rate for each 10% of increase in military expenditures, on average. They present some negative spillover effects which associate higher military burdens with higher taxation, shifts from agriculture to manufacturing, and lower saving/investment shares. Smith (1980) also finds a negative impact of military expenditure on investment in 13 OECD countries. Hence, even despite major investments and innovation efforts related to military expenditure, a clearly attributable effect of military expenditure on economic growth is absent. The inconclusiveness of the literature on the growth impact of military spending serves as a reminder of how difficult it might be to properly identify the presence/absence of “green growth”. However, even if causality between military expenditure and growth is difficult to establish, it is still worthwile to evaluate similarities/differences in the links between military expenditure and growth on the one hand and green expenditure and growth on the other hand. 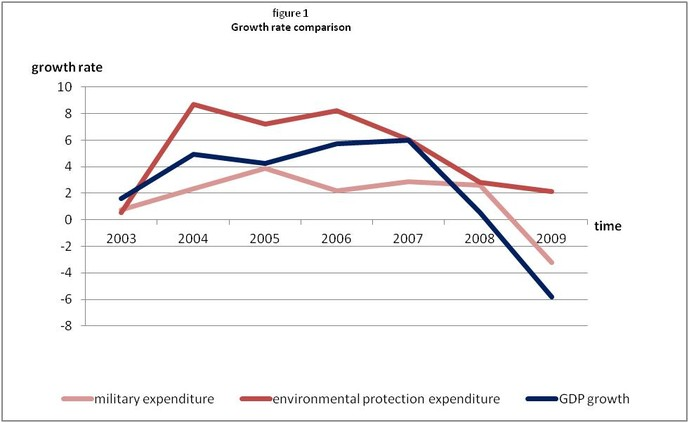 From Figure 1 and Table 1 we learn that between 2002 and 2009 military expenditures grew more slowly than the economy while environmental protection expenditures grew at almost twice as much as GDP. One possible explanation for the relative increase of environmental protection expenditures compared to military expenditures is a change in preferences. Such a shift in preferences might have many reasons, one of which could be changes in risk aversion when countries grow richer. We can assume that increases in per capita GDP would also increase risk aversion, bringing new phenomena within the range of risks which the population is willing to pay to be protected against. In addition, risks generated by environment-related phenomena typically concern the long run, while military risks concern more the medium and short term. As rich countries should grow more slowly they feature a lower discount rate. Hence, they value distant risks more than poorer, faster growing countries. In other words, our evaluation of insurances evolves together with our wealth. 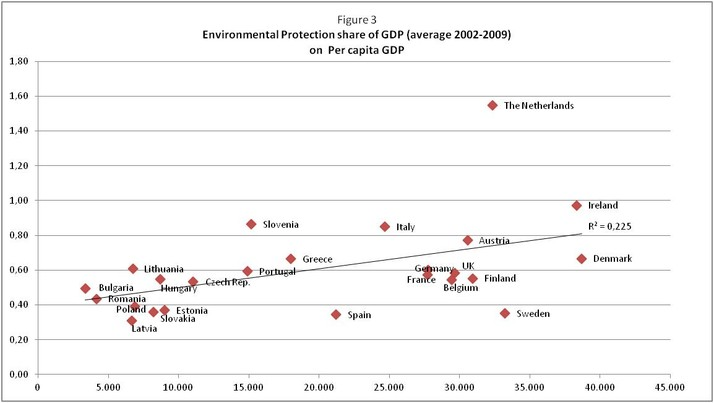 By way of contrast, the share of spending on environmental protection in GDP appears clearly linked to the wealth of European countries. While poorer countries (<20.000 € per capita GDP) spend only around 0.5%, the richest countries (>30.000 € per capita GDP) spend around 0.75 %, or about 50% more. Along these lines it would also be worthwhile testing whether faster growing countries that have a higher discount rate insure less against long-term risk.